The presence of the iPhone 5S and 5C in this world at least have made the iPhone 5 owners are tempted to taste one of them. The question that often arises is: What is actually the difference between the iPhone 5, 5S and 5C? And which is actually the most suitable for me? 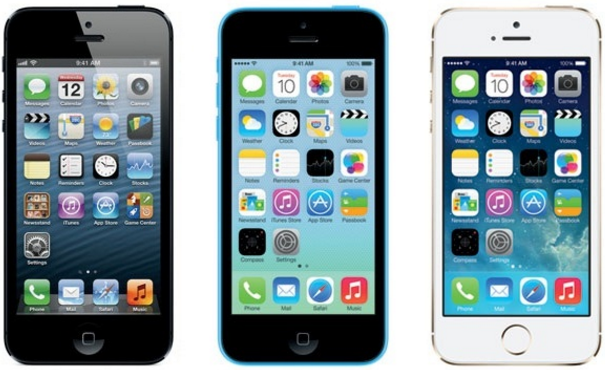 Let's take a closer look at the differences and comparisons of the iPhone 5, iPhone 5C, iPhone 5S. Because it brings the same screen, these smartphones look something like one another, even the dimensions of Iphone 5 and Iphone 5S exactly alike, while at 5C there is little difference in thickness and weight. But when we look a little closer, we would immediately be able to identify that all these three are different iPhone. Viewed from the front side, the iPhone 5S does not have a white box icon on the main button like the one on the other - even that has existed since the first-generation of iPhone! The button on the 5S now plain and has feature it is touch fingerprint sensor ID. Yep, we can access the lock screen on iPhone 5S with fingerprint. Not just any lock screen, Touch ID is used as a verification Apple ID (AppStore and iTunes). This is what makes many people run to iPhone 5S, are you one of them? As we said earlier, the third of these phones have a wide screen which is the same even specifications are also identical, namely: a 4-inch multi-touch; IPS LED-backlit; the resolution 1136 × 640; 326 ppi; density retina display. Looking around the physical of three heroes above, the difference is clear. iPhone 5 and 5S has a housing exactly the same but now the iPhone 5S has 2 colors latest gold and dark gray while the black color variants (such as the iPhone 5) is no longer available and the color white (silver light ) is still maintained. On the other hand, the iPhone 5C has a completely new design, memorable "candy." Housing iPhone 5C with plastic and thicker, and has 5 different colors: green, blue, yellow, pink and white. Besides thicker, iPhone 5C also heavier than the other iPhone. 5C has an extra weight to 0.8ons (20 grams). In addition to these differences there are also similarities that all the iPhone 5, 5C and 5S have a volume button placement, silent switch, speaker, mic, lightning connector and a 3.5mm audio jack that is still the same. iPhone 5 and 5C powered by the same engine innards exactly the 1.3 GHz dual core processor Apple A6 and 1 GB RAM. That is, the display sector and the engine 5 and 5C have the exact same capabilities, only now 5C comes in a choice of colors candy. 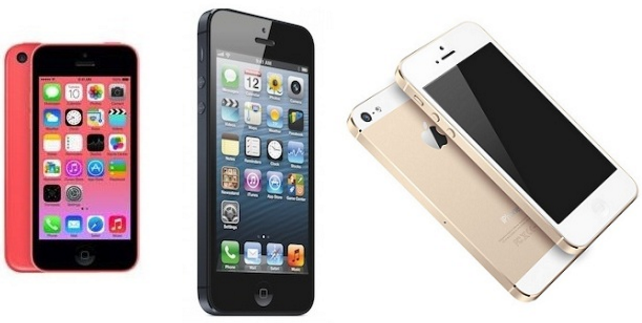 Although the design is identical to the iPhone 5, iPhone 5S has an entirely new engine innards. iPhone 5S is the first phone that has a 64-bit processor architecture, which was named by Apple A7 and M7 equipped with a special co-processors handle motion function. Apple did not give a detailed explanation of the latest processor Apple A7,however sourced from Anandtech, A7 ARMv8 allegedly a dual core processor called the "Cyclone" 1.3 GHz speed. RAM capacity is still the same for the 1 GB. iPhone 5 and iPhone 5S have the same capacity for internal memory they are 16GB, 32GB and 64 GB, while the iPhone 5C is only available in a choice of 16GB and 32GB. iPhone 5S has the latest features on the front camera, the iPhone 5S has a 1.75 μm pixels while 5 and 5C 1.9μm pixels, which means the camera "Facetime" iPhone 5S can produce better photos in the dark room. In addition, the front camera iPhone 5S has an aperture of f / 2.2 with dual LED flash, as Apple called it the "truetone flash." Flash truetone Apple claims this will result in more natural light than the ordinary flash - owned iPhone 5 and 5C surely. And Then Which Kinda iPhone Suits You? Yep, the iPhone 5s is the best choice among the three. iPhone 5s has aluminum body like the iPhone 5 and also updates the features and specifications of the above two other iPhone processor. But talking about the price we think we need to review and over again what exactly that you need. iPhone 5C is suitable for you who like to be colors that cheerful gadget. 5C visually certainly makes you look different among other iPhone owners. The price is also cheaper than iPhone 5S, so that you have excess money that you can spend to buy iPhone accessories like cases, powerbank and others. Belum ada tanggapan untuk "Iphone Buying Guide: The Differrence Between iPhone 5, 5S and 5C"